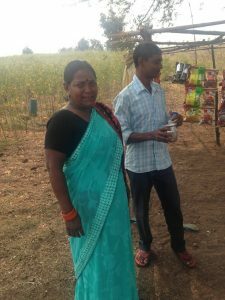 One early morning in mid December we left to uncover research the Bhil and Rathwa tribes. 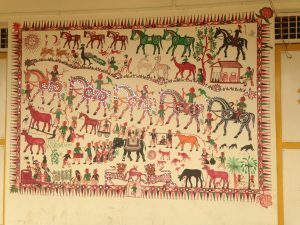 Bhuribai the welll known Bhil artist travelled with us. 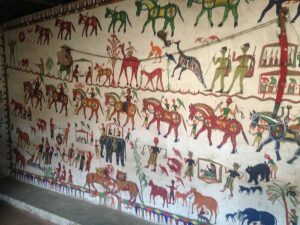 It was a long and comfortable drive to Jhabua. 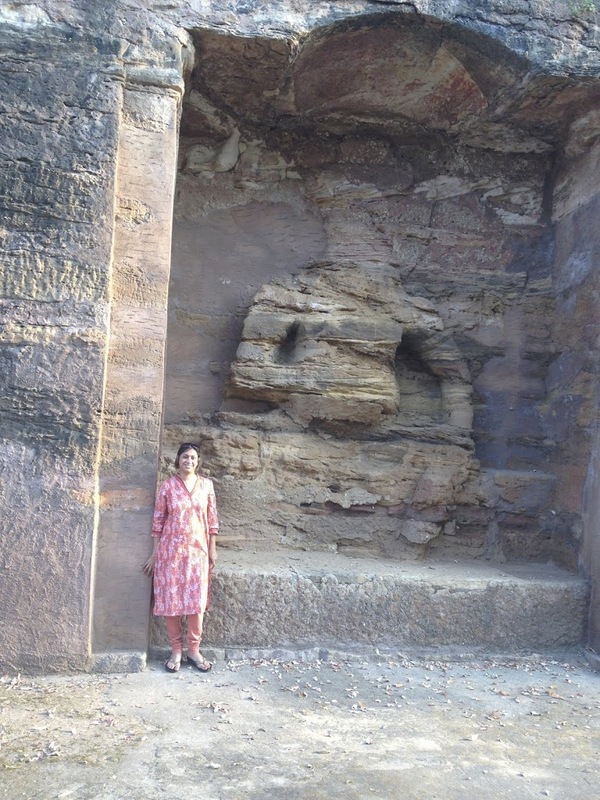 On on way we stopped by at the Bagh Caves. 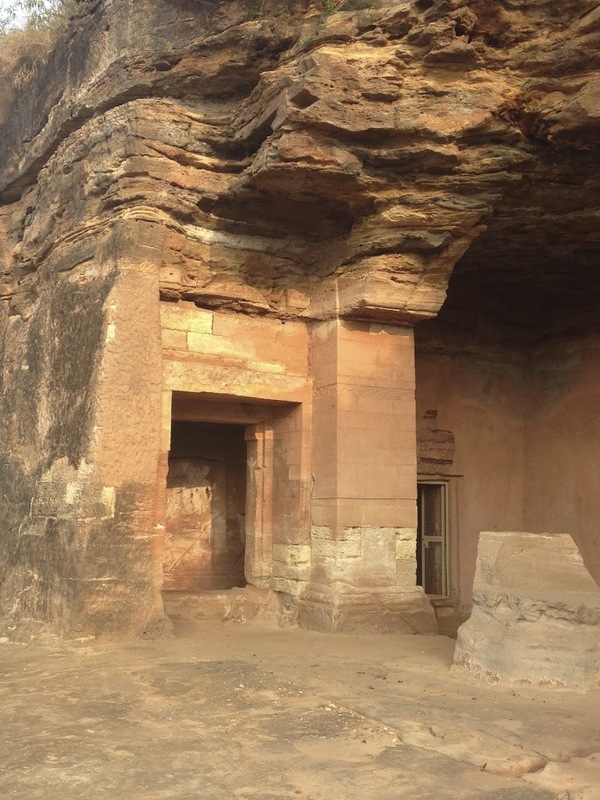 These are the seven rock-cut Buddhist caves and were made in 5-7th century. Located on the far side of the Bhagini River. Of nine original caves, only seven remain. 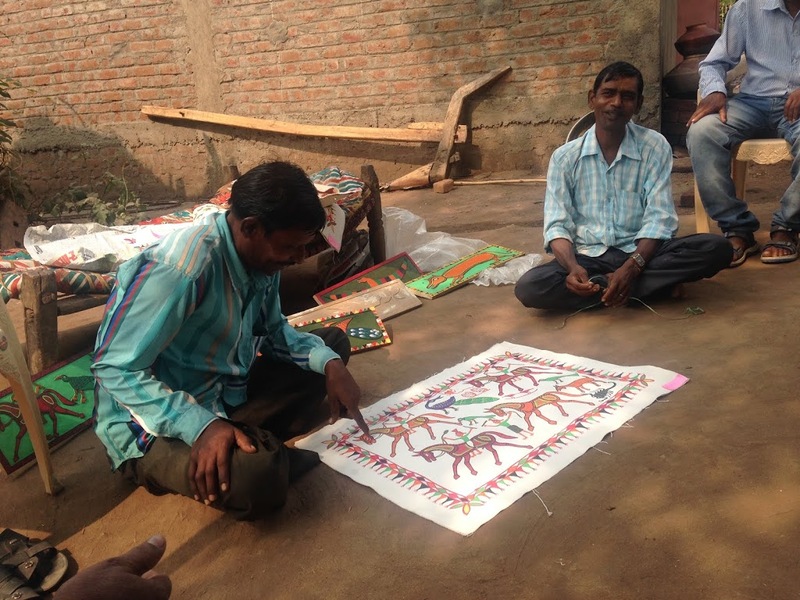 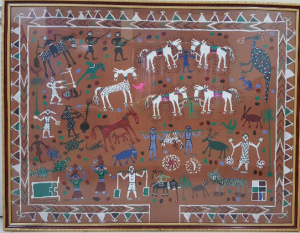 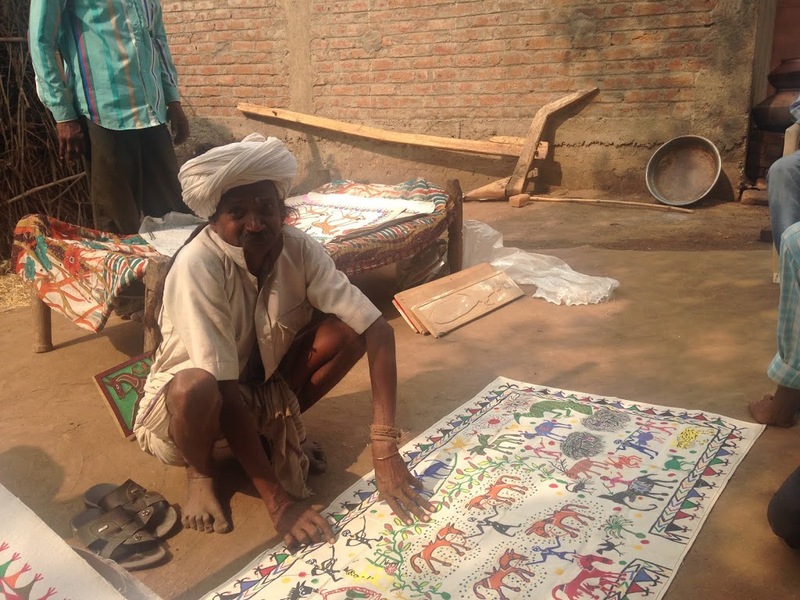 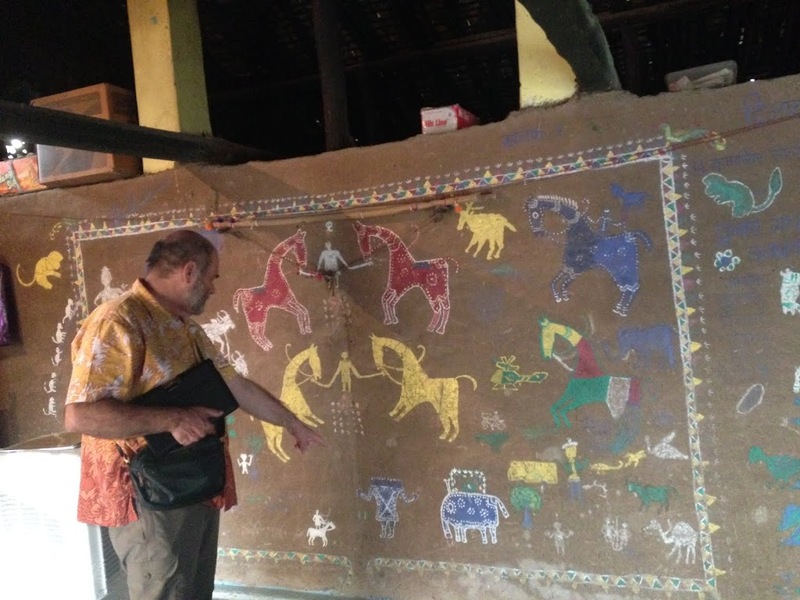 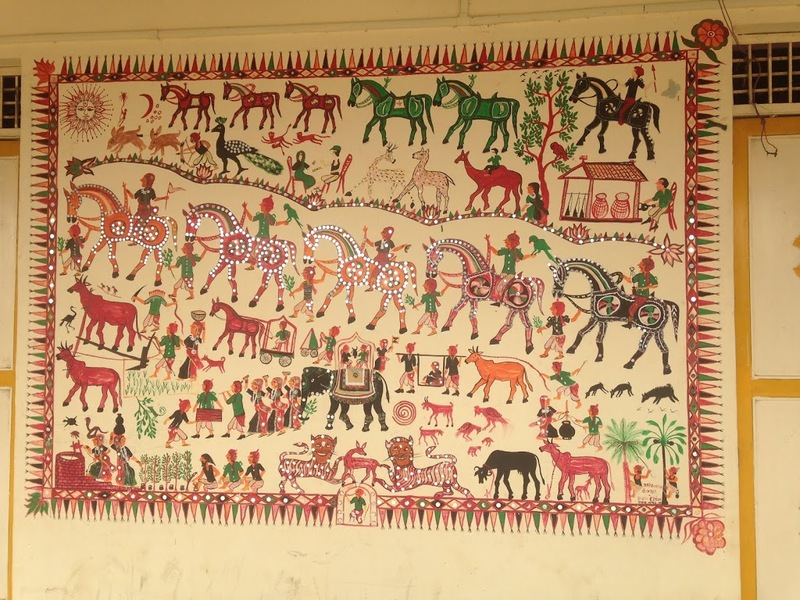 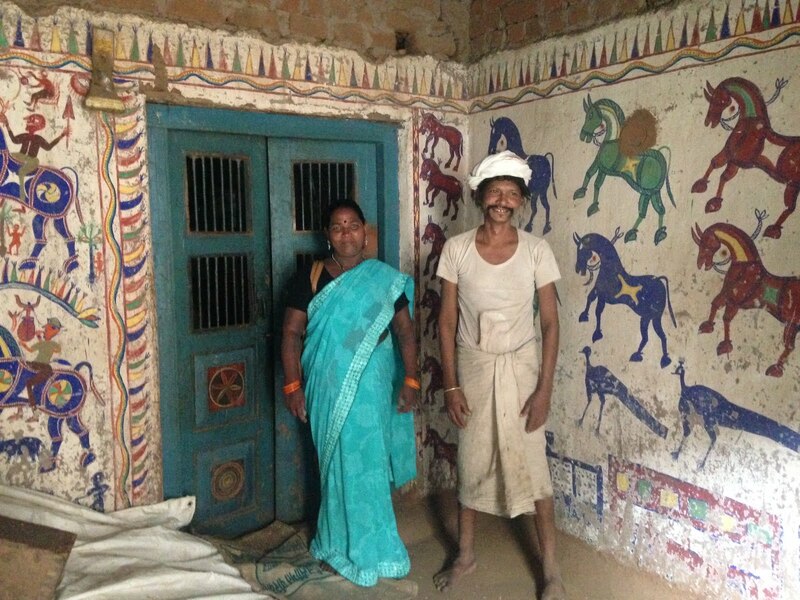 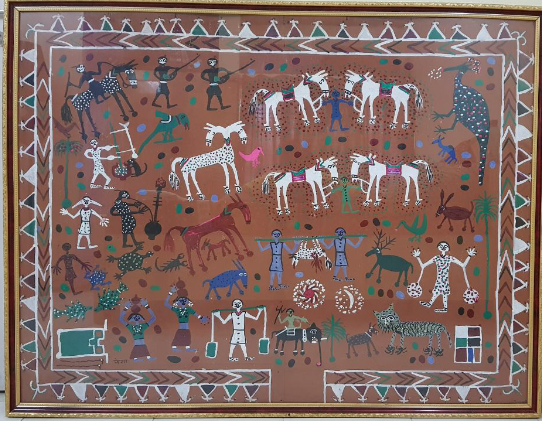 Lakhendra is the creative person who makes the Pithora paintings.The tradition of Lakendra is passed from one generation to the other.The father teaches his son or sons to paint on the walls.Only men are permitted to make the Pithora painting. 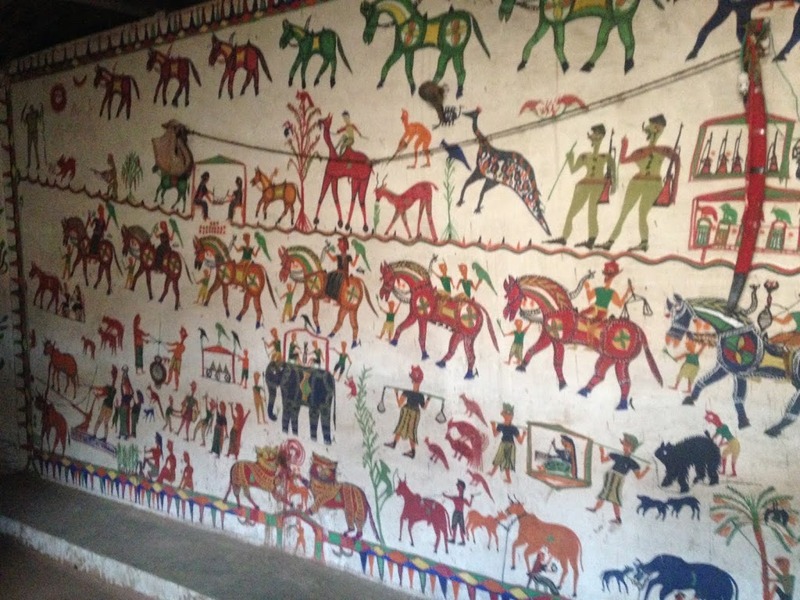 The Pithora painting is a typical.It has some definite figures and these are essential parts of the whole painting.The first part is to draw the enclosure that binds the paintings and sets the limits.He then draws the Baba Ganesh, always depicted smoking the hukkah.The second is the black horse the Kathiya Ghoda, who invites everyone for the ritual and dinner.The four main four white horses facing each another are painted.Women carrying pitchers(panihari) , the Rani kajal is a two headed horse and is god of rain are painted.There is also a image of a copulating couple called Chinhal present as a part of the painting.Presence of a 12 headed man with a snake and a sword called Baar Matha no Dhani the is always part of the painting. 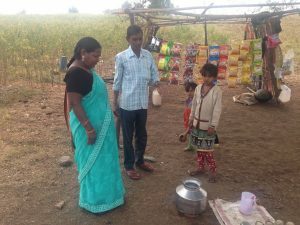 On our way back from Bhabra we saw Khajoor toddy( Date toddy) sellers most of them were little children.The road was dotted with these little vendors who sat with a big Handi(pot) and a small glass. 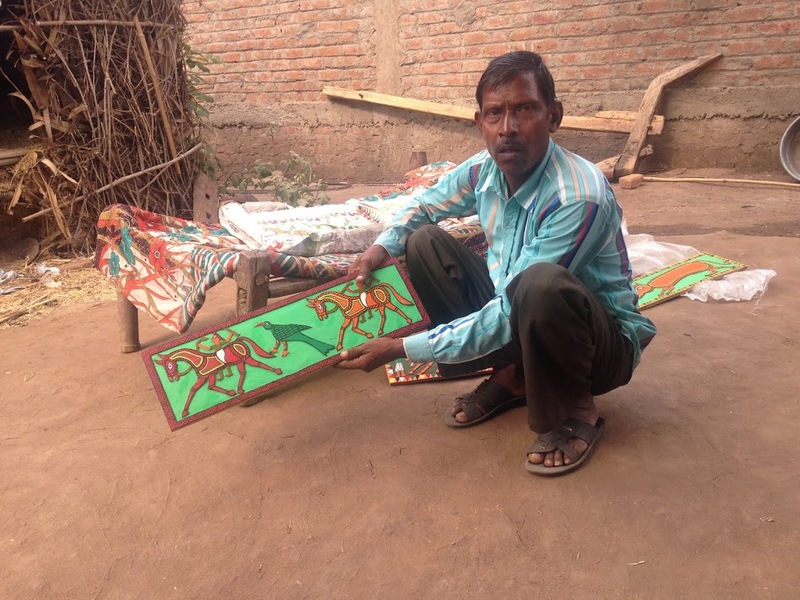 Nandu Lal a Pithora artist showed us his paintings and wood carvings. 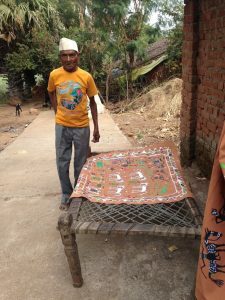 A Badwa from the village was present and explained his role in the ritual of the Pithora.He also sang stories of Dharmi Raja. 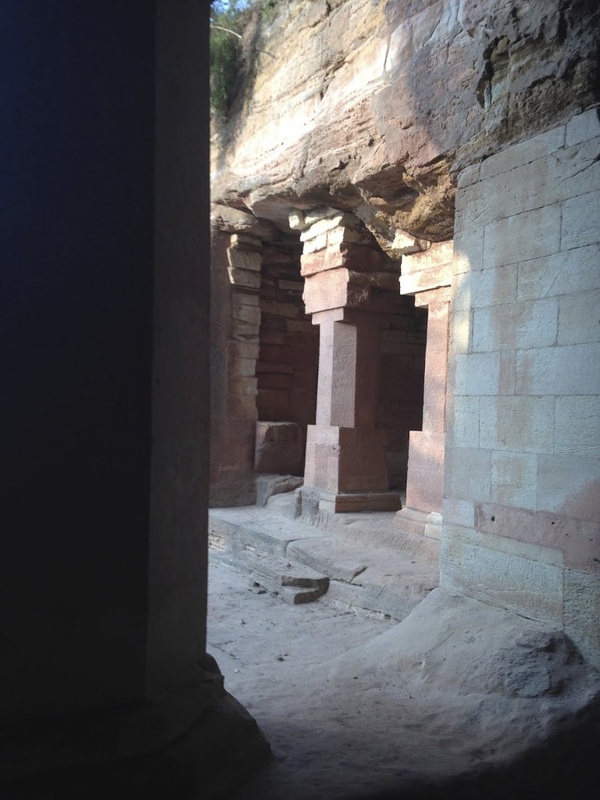 The village Badwa is the chief Priest or Shaman, the person whose vow gets fulfilled approaches the Badwa to discuss the whole ritual and select a Lakhendra. 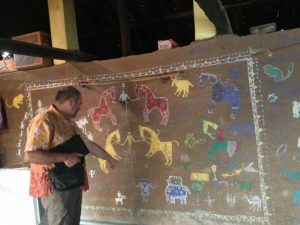 Akho Pithora painting is generally done on three walls of the house.It has 18 celestial horses.The ceremony starts by painting Baba Ganesh . The main Pithora seen with the celestial horses. 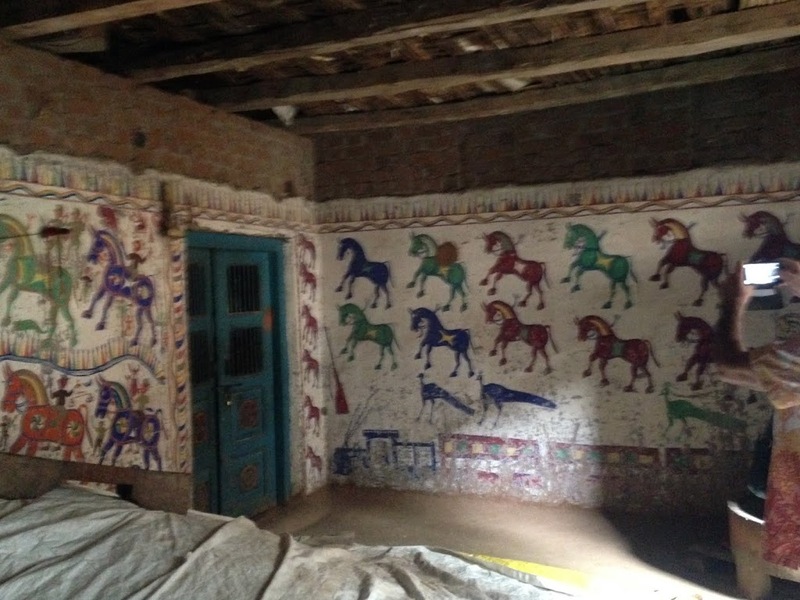 The owner of the house and Bhuri BaiWe reached the village to see a Akho Pithora painting.The drive was very picturesque.We wished to spend time exploring the countryside , but our guide warned us .He said it was too dangerous to be unescorted, he said this area was inhabited by thieves and notorious people.We had no clue that we would experience a moment of this in the hours to come. I realy like your work. 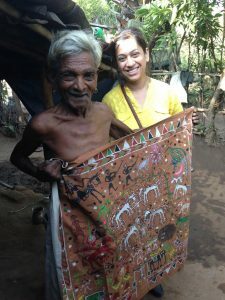 I do tribal photography and wondered if there is scope to colaborate. 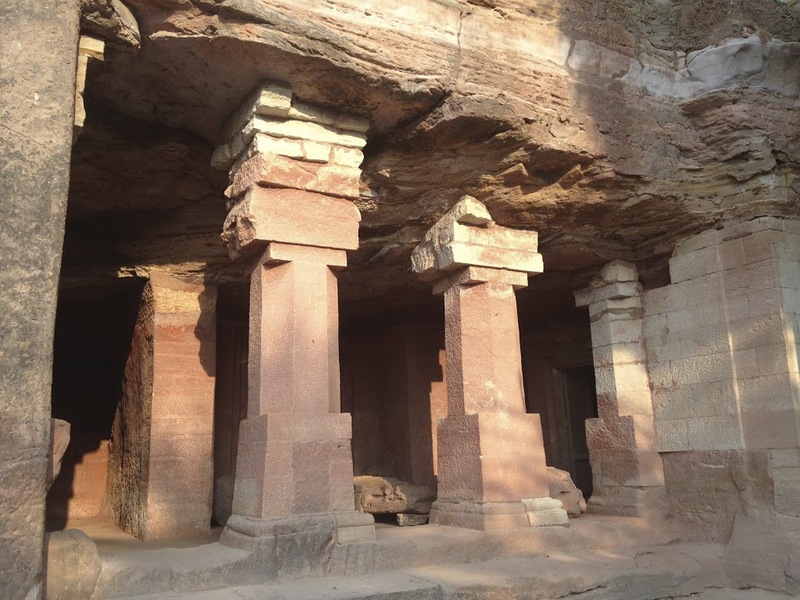 My Instagram acount: @bharatpatelphotography. Thank you.